The PT-D800W is a professional labelling machine that produces labels up to36mm in width. Print text, barcodes, images and logos onto laminated, durable labels that are suitable for indoor or outdoor use. Alternatively connect by USB or Wi-Fi to design labels on your PC, Mac, smartphone or tablet using the free label design software and apps available. Professional label printing wherever and whenever needed. With a wide range of tape colour combinations and high speed/high resolution print capabilities, the PT-D800W is ideal for cable marking, facilities management, document archiving, asset labelling and creating on-demand labels whenever and wherever required. Choose from the many built-in label creation options, or use USB or Wi-Fi connectivity to design and print labels from your PC/Mac, or on your iOs/Android smartphone or tablet. Wireless connectivity for ultimate flexibility Create and print labels from your smartphone or tablet quickly without needing to boot your PC or Mac. The Brother iPrint&Label app connects wirelessly using Wi-Fi Direct to let you design simple labels on your iOS or Android device. 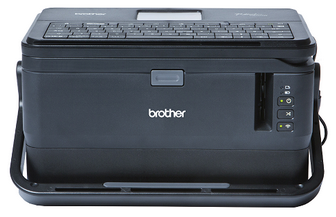 The PT-D800W can also be connected to your office wireless network, and allow multiple users to print labels from their PC or Mac whenever required. Featuring a full size laptop style keyboard with integrated easy-to-read graphic display, the PT-D800W can be used on-site to instantly create durable labels on demand. Use the many built-in templates, block layouts and hundreds of office and industrial symbols to quickly create labels for any application.